I haven’t posted since April 11th. So much has happened and painting and sketching have not played much of a part. I think we are through this period which was filled with family health concerns and effects, too many volunteer tasks for the watercolor society I love (my own doing), and last but not least, taking on the joys and responsibilities of a new puppy and kitten! My dear husband Tom has come through nine weeks of radiation in good spirits and ready to travel. 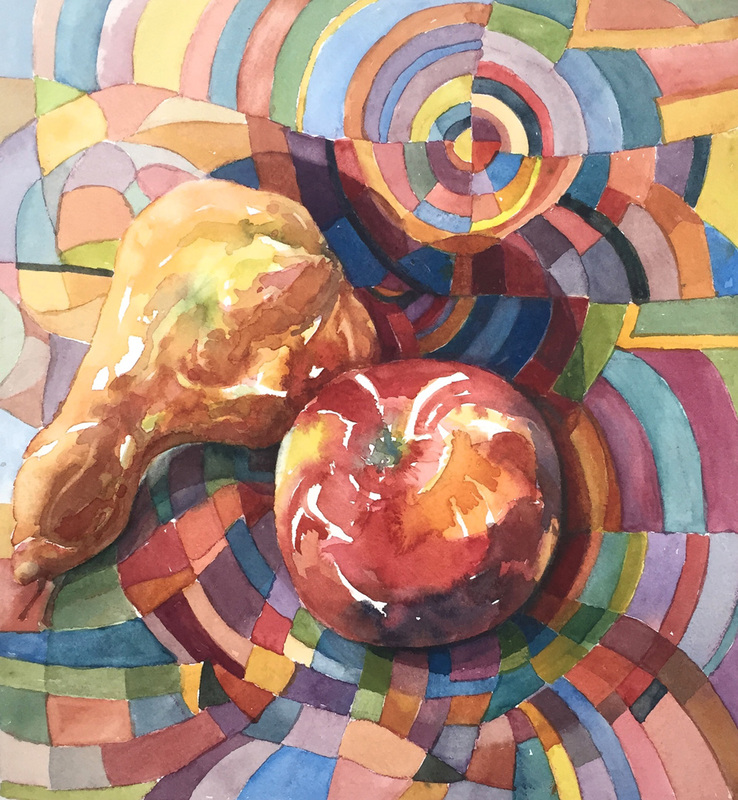 The Niagara Frontier Watercolor Society’s 13th National Exhibition of Transparent Watercolor 2016 is pretty organized and ready to go, opening on October 16, 2016. 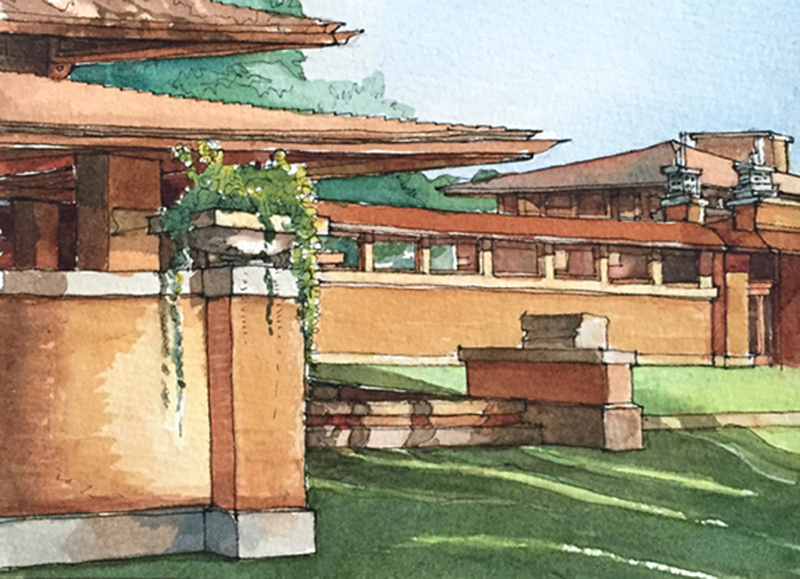 I got to work with one of my heroes of watercolor, Thomas W. Schaller, the juror and also our Fall 2016 NFWS Workshop Artist. The NFWS Website is up and running and a huge improvement over our outdated site. I’m the webmaster, so-called. Our NFWS Facebook page is also in good shape. I’m the administrator, and that is pretty easy and mostly fun. The puppy, our now almost 5 month old Golden Retriever, Bessie, and our tabby kitten, 6 month old Diego, are not wrestling with quite as much abandon as they were in the first 4 months, but they are still a handful, mostly joyful. 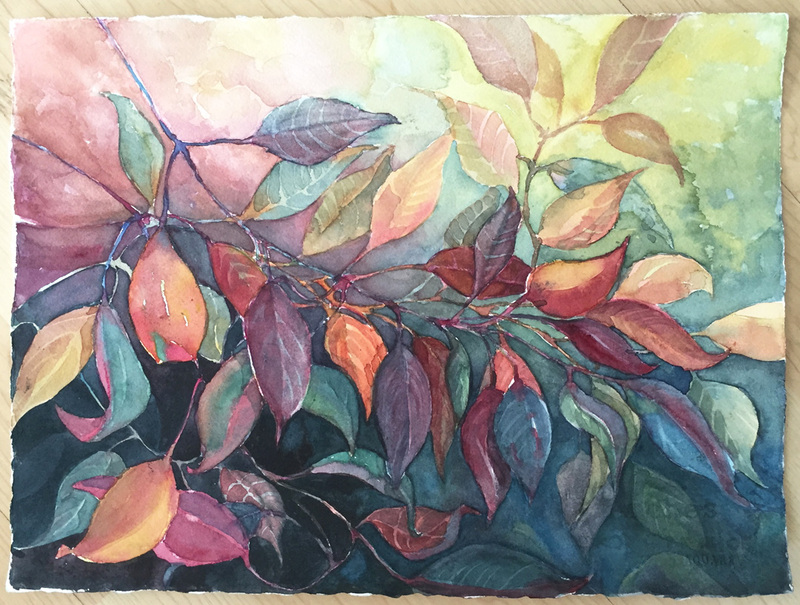 I haven’t done much painting, though when I look back through the spring and summer months, I am surprised at what I did produce! 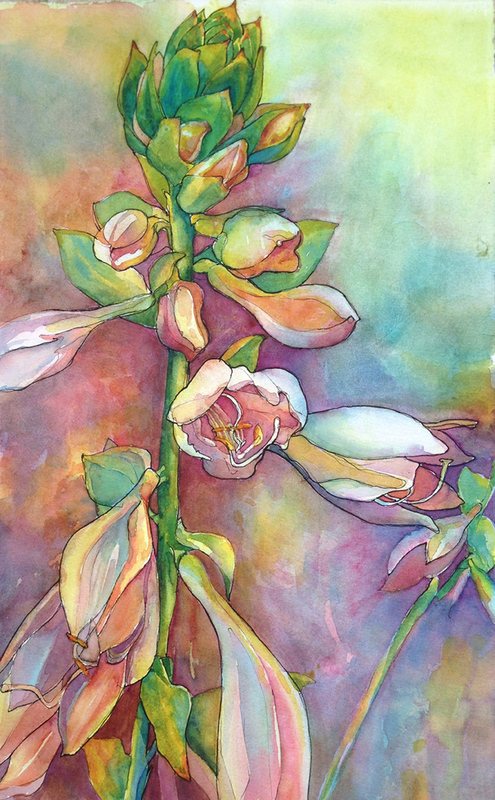 On May 13th, I began a watercolor painting as a demo for the Evans Art Guild. I finished it at home and entered it in the Niagara Frontier Art Exhibit at the Kenan Center, juried by Gerald Mead, and won an Honorable Mention Award. It’s of one favorite views, from my morning walk, “Sunrise Over the Rose Garden” at Delaware Park here in my neighborhood in Buffalo, NY. From Mid-May until today, I’ve taken part in a drawing fundraiser for Hallwalls, our very cool contemporary regional gallery. You draw for 45 minutes together with 15 other artists, and then the drawings are bid on in a silent auction.There are two sets of 16 artists each. Fun. 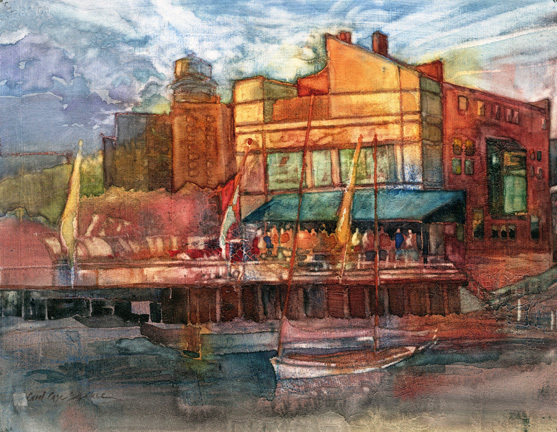 I also donated a pen and ink and watercolor painting for their gala fundraiser. It’s Allentown on a First Friday Open Gallery night in early spring. During the Buffalo Gardens Buffalo Niagara, I painted one night in Gordon Ballard’s and Brian Olinski’s garden. I love their home, and concentrated on it, being the retired architect that I am. The Garden Walk took a lot of my energy. 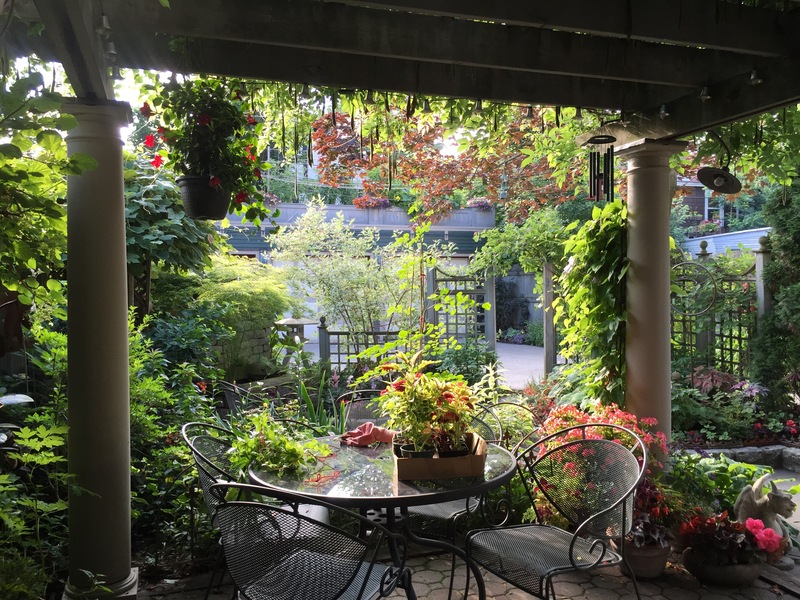 We love opening our yard to the hundreds of garden enthusiasts that come through the last weekend in July, but it is a lot of work, work I love. Gardening definitely trumps painting for June and July. I do a bit, though. These two paintings inspired by our gardens were in two shows in Western New York this summer. The one on the left was in the Garden Mystique Show at Artsphere, and the one on the right in the Buffalo Society of Artists Matchbox Show at Miebohm Gallery in East Aurora, NY. I am painting a bit again. Have three new paintings, two of which are I’m submitting for juried selection into the Buffalo Society of Artists Fall Exhibition 2016. On the left is “Tom’s Shop”, and the right is “Keep Alley”. We’ll see if they make the cut. You absolutely can never tell! Before I finish this long blog post, I am going to promise that I will post in mid October after our one month trip to Italy. I sketch every day, post every day on my Facebook page, but won’t be posting here til we get home. My last image is my favorite. In July my daughter Liz and my wonderful granddaughters Savannah and Eliza came up from North Carolina for a brief visit. Savannah and I painted together. She entitles this beauty, “The Ballerinas.” I love it. I don’t choose to paint flowers often, though I am a serious gardener from May through October, and I love flowers and gardens. 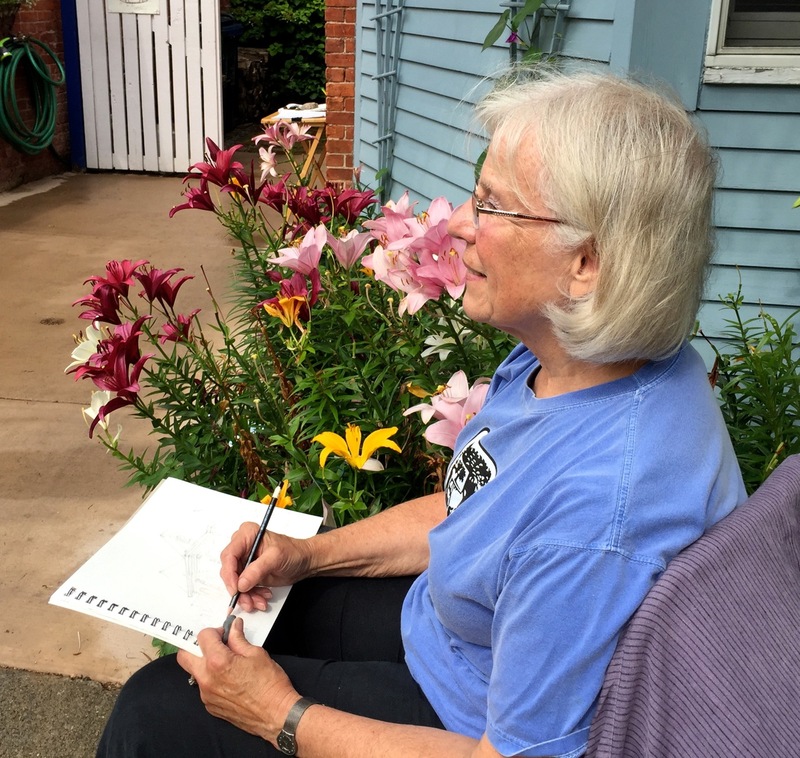 Occasionally my watercolor mentor and friend Sally Treanor gives our Monday morning group a flowers assignment. I am generally reminded when she does that I like to paint anything and everything. These are daffodils from last year at this time. The freer I am with my brush and paint, the better. The painting on the left is more successful, in my opinion, than the one on the right. Painting freely is a struggle for me. Why? Because I can paint realistically so easily, so much easier than painting an impression. 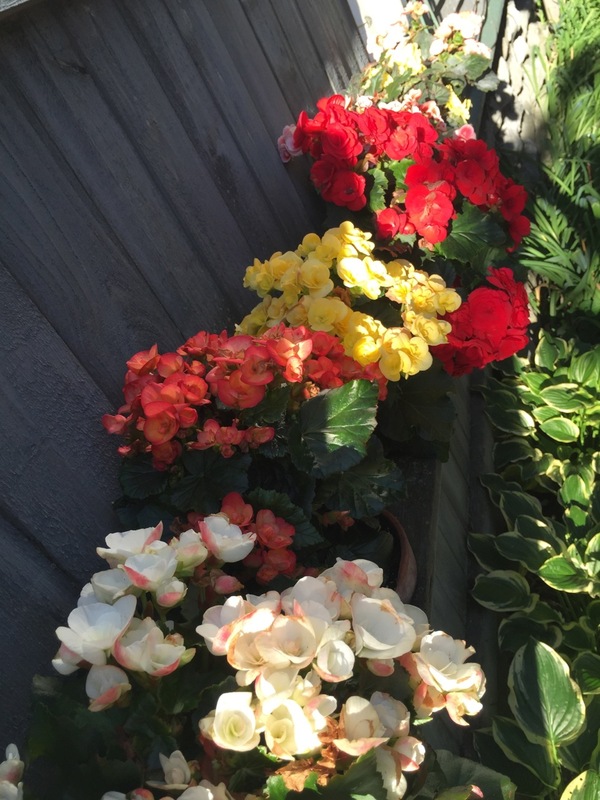 Compare the “pansies” on the left, “begonia” on the upper right and “red cabbage” to these more realistic paintings. Nice, but not what I want to do! My hero Charles Rennie Mackintosh, 1868-1928, the Scottish architect and designer turned watercolor painter, paints graphic interpretations of flowers. Look at these! Mackintosh’s architectural designs, primarily viewable in Glasgow, not the least of which was the Glasgow College of Art which was nearly lost to a devastating fire in 2014, inspired me to become an architect. His paintings inspire me in my painting. 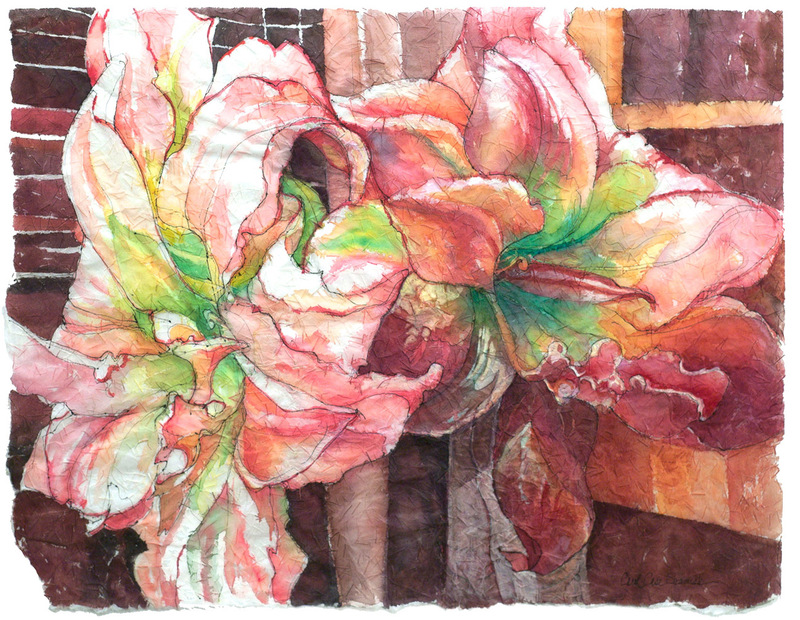 My favorite floral painter today is the Brit Shirley Trevena. Her work is both nuanced and free and full of color and line and I love it! I will keep painting floral subjects, though I prefer landscapes and cityscapes. Here a few more of my paintings and sketches from the recent past. Hope you like them. This Spring and Summer I will have two of my paintings on posters for great events here in Western New York. The first will be the 3rd Annual Buffalo’s Cherry Blossom Festival. 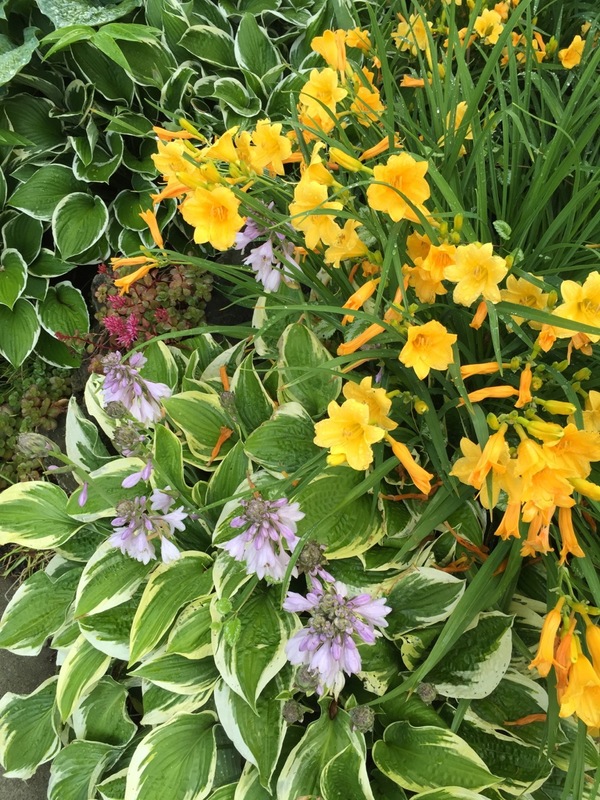 The second event, the largest free Garden Walk in the USA, will feature my hosta on its poster for Garden Walk Buffalo 2016. 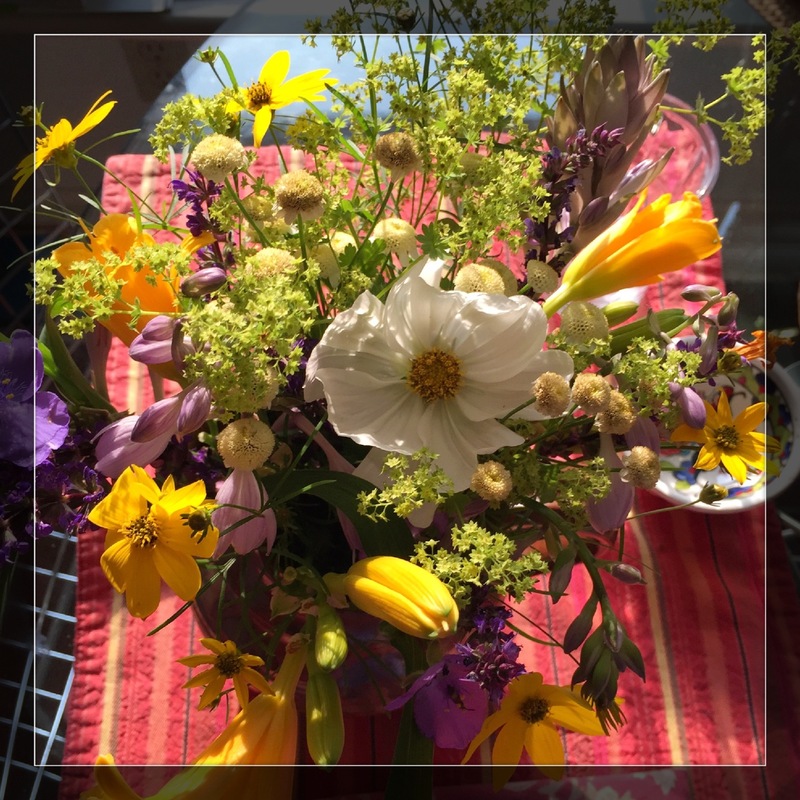 Happy Spring and Summer! These past months of January and February 2016 have been so intense! My solo show, Captured Travels opened with a beautiful, well-attended reception at Betty’s Restaurant, 370 Virginia Street in Buffalo, on Monday night, January 25, 2016, and will be on view through March 20th. I collected brand new and some older paintings, both studio and plein air, and sketches, and put them all together. Kathleen Sherin did a marvelous job curating and hanging the show, and I sold 10 of the 23 pieces on opening night! This is a very recent painting that graced the publicity for the show, Palermo’s Finest. I could have sold it several times! 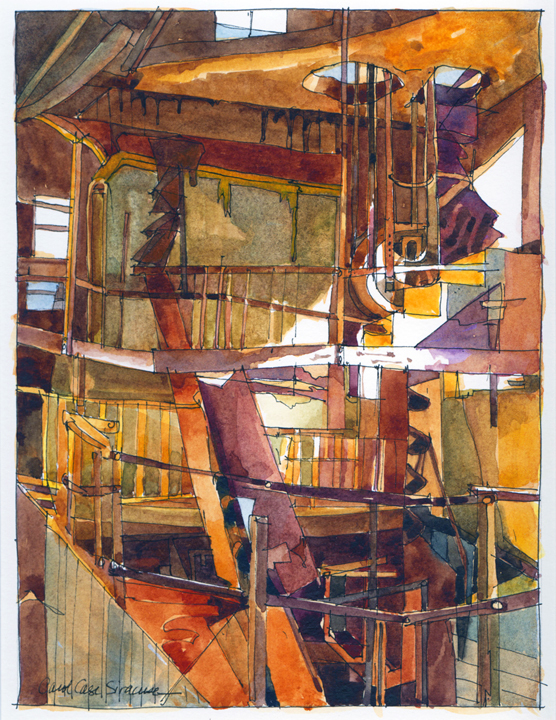 This is a plein air painting, watercolor and ink, from our trip this past fall to Paris. The painting of the Pont de la Tournelle below is from a photo Tom took of me painting the Isle du Saint Louis above! 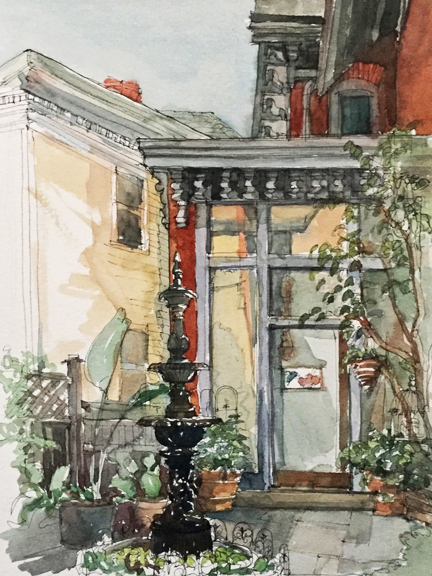 Two more ink and watercolor paintings are of the Paris Backyards and Cimitiere du Pere-LaChaise, Paris. My architectural background and love for detail comes out in this ink sketch of a Detail from the Palais Garnier in Paris. I have painted many views of the towns and landscape around Lake Como. Perledo above Varenna, with the “hand of God light”, and the Villa Monastero, one of two beautiful villas open to the public along Lake Como in Varenna. Here I am painting in Varenna. 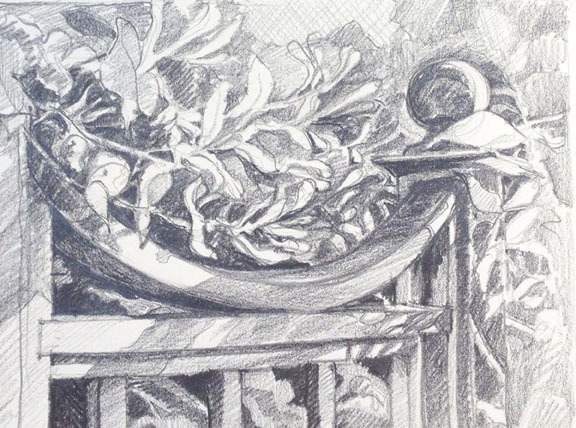 The first year that I started to sketch when we travelled was 2010 when we spent some time in Cinque Terre, Italy. These two ink sketches are from there. We also visited Bologna where we were fascinated by the medieval timber frame architecture. In Tuscany it was all about the views. and Scotland, Portree near the Isle of Skye and the Duart Castle. 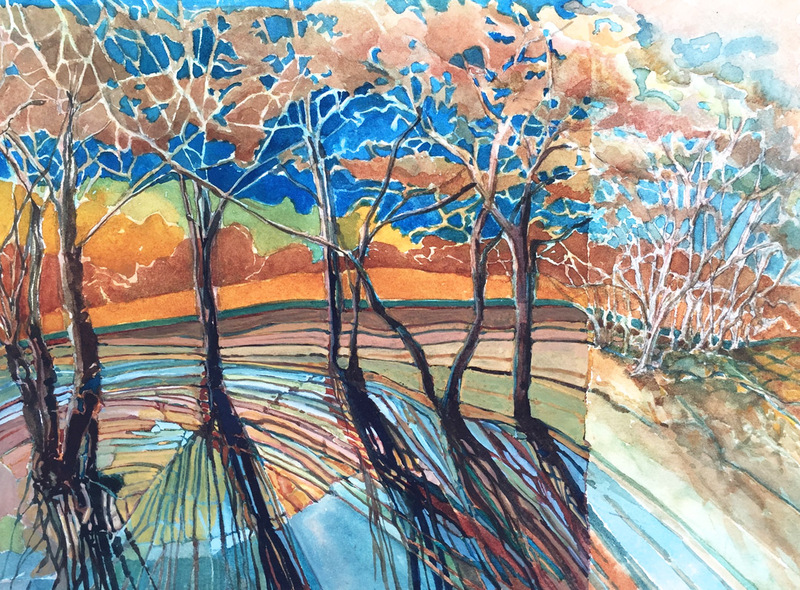 We will continue to travel as long as we can and I will continue to capture our travels in sketchbooks, plein air paintings, and studio paintings. Such a rewarding time. 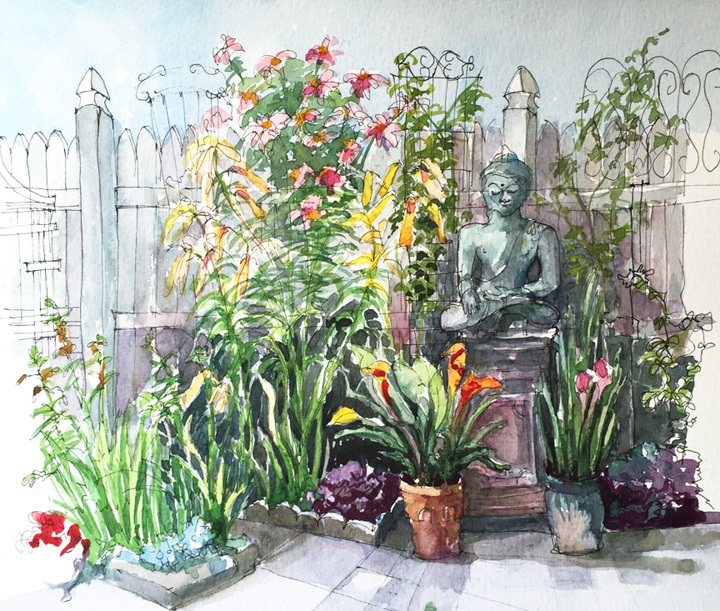 For the past two years, in July, as part of the National Garden Festival here in my home city of Buffalo I have taken part in the Artists in Gardens, a very enjoyable opportunity for local artists to sit in beautiful gardens and paint. 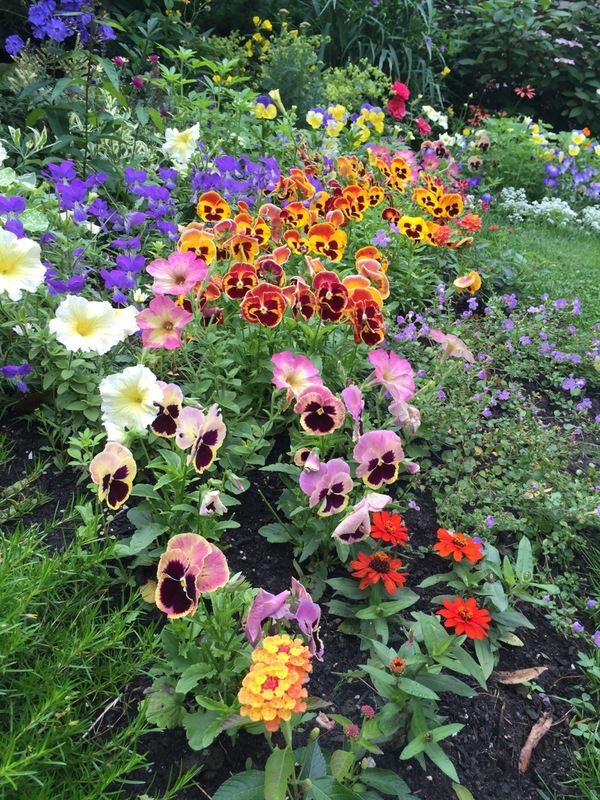 These gardens are open to the public the same time each week, Thursdays and Fridays. I painted in four gardens this year and twice in the same garden last year. 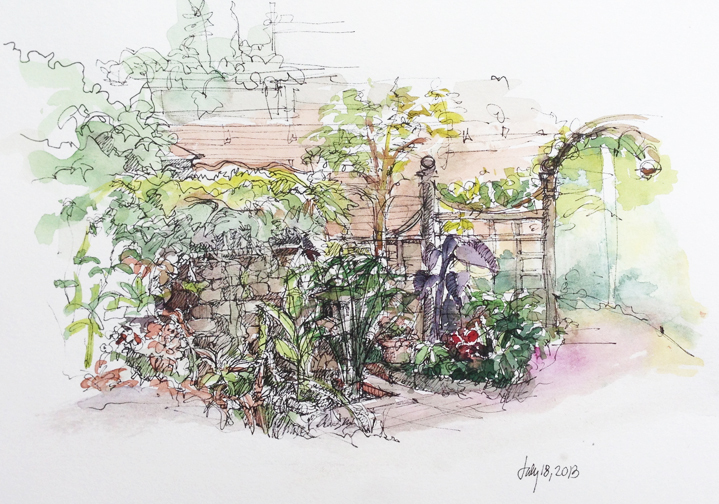 I also enjoy sketching and painting in my own garden. 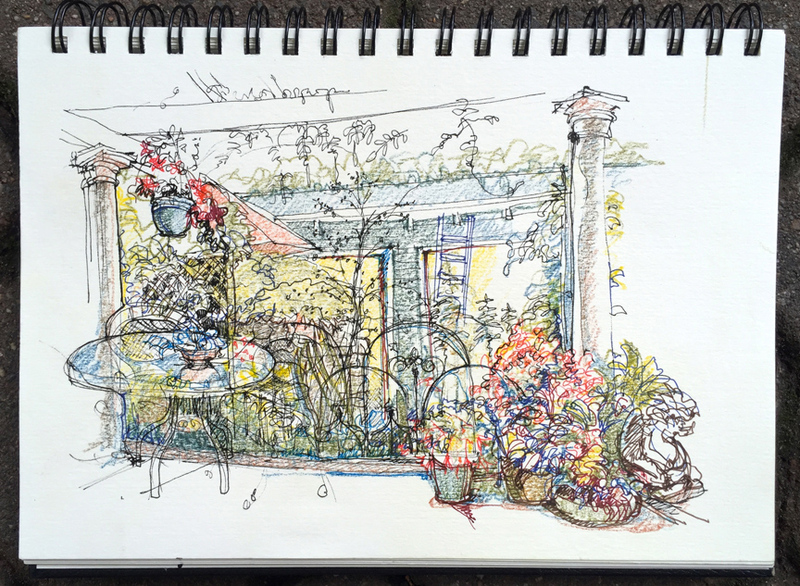 Here I am hard at work on a pen and ink sketch of Ellie Dorritie’s front yard. I haven’t finished the watercolor additions yet, but here’s the sketch too. 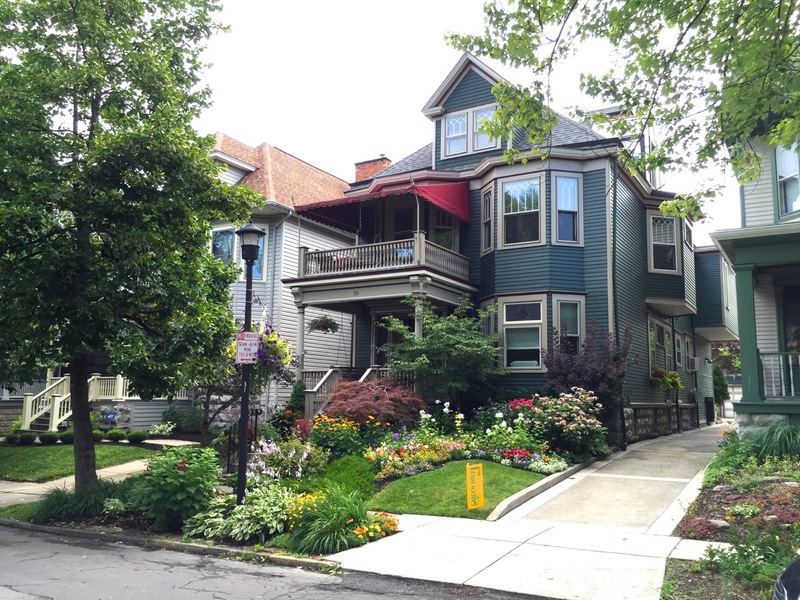 A great cottage on Little Summer Street in Buffalo. I also painted at Arlan and Dominic’s Garden on Norwood Avenue. 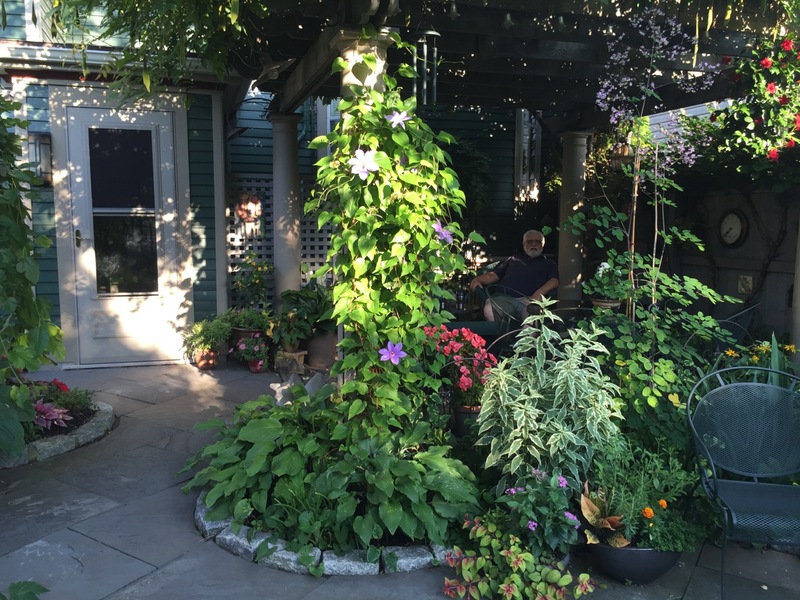 Arlan and Dom have been involved in the Garden Walk Buffalo since its inception. They have a wonderful victorian home and a yard full of surprises. As a former architect I was drawn to their back porch and back elevation. I drew this in pen and ink and added the watercolor while I enjoyed ice tea and even birthday cake made by Dominic. What lovely people! There were two other homes whose gardens I painted, one the Timlins’ on Park Street. The point of view was challenging, but I think I did an ok job.This is a beautiful brick home with a very sensitive entry and garage addition. Nicely done! 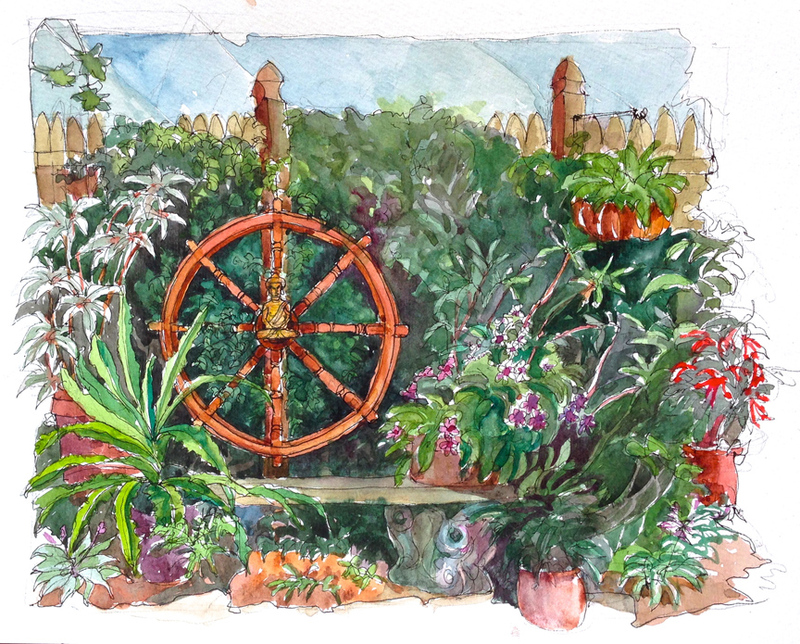 The last garden I painted in I also painted in for the 2014 Artists in Gardens. 8 Paths Garden is unlike any other I have seen. Such a eye and attention to detail. The gardener has an unusual selection of plants, some that I’ve never seen before. 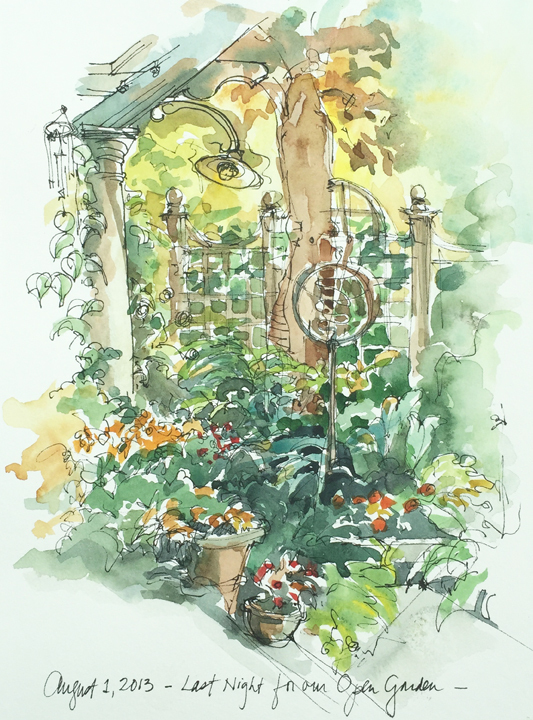 I also like to paint and sketch in my own garden. Here are a few from the last three years of Garden Walks, together with some photos of our garden. 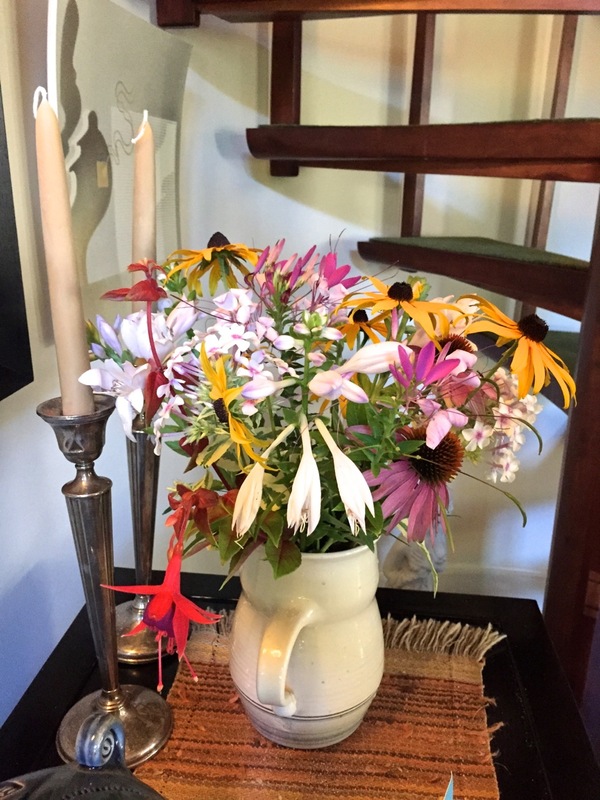 I also like to pick flowers and make bouquets just as my father the gardener used to pick so that my mom the artistic flower arranger could work her magic. Every bouquet reminds me of them. I have learned something, sometimes many things, from every water media workshop I’ve ever participated in. Just finished one with Susan Webb Tregay which leaves me with Sue perched on my shoulder whispering one of her multitude of quotable quotes all great advice about color and composition strategies. Maybe my favorite is the most piercing -“things not worth painting are not worth painting well”. 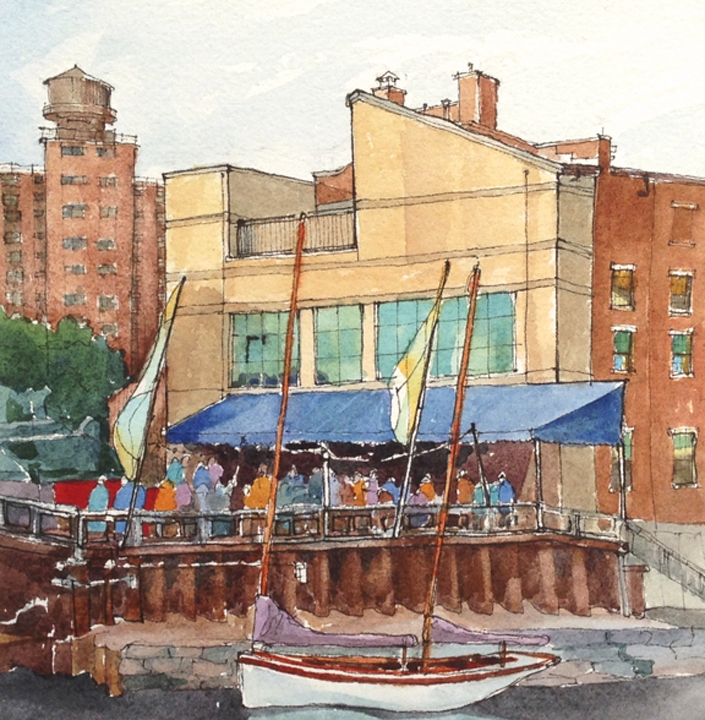 All that being said, one of the approaches to watercolor and its paper that has most stuck with me, and continues to challenge me, is what Mark Mehaffey had us try during the Niagara Frontier Watercolor Society’s Spring 2013 Workshop. Paint with watercolor on gesso coated arches 140 lb paper. Two coats of gesso each side, dry in between. Paint in any set of colors you choose all over the paper, best if pretty intense but not required. 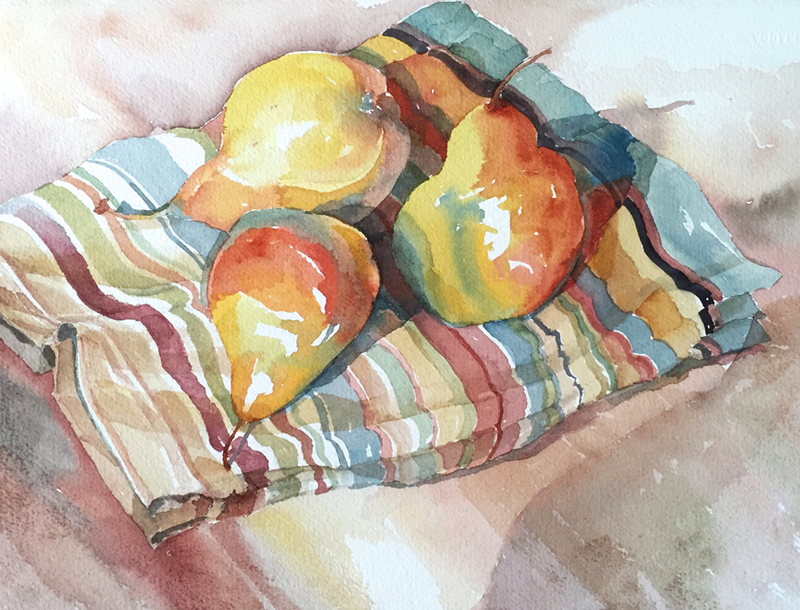 My first attempt, after the workshop was over and I had had a chance to mull over all that I had learned, turned into a “harmony of intensity” color strategy without any conscious direction from me. I call it “Loving Burchfield” because it reminded me of one or two of Charles Burchfield’s periods. Being a Buffalo resident, and a former docent at the Burchfield Penney Art Center, I have spent a lot of time studying Burchfield. He was a lover of light and nature, as am I. My second attempt was not as successful, in my opinion, as the first, and I think it’s because of the rather intense color scheme. It could be relieved with some much lighter tones, and a little more cool areas of contrast to the warm. 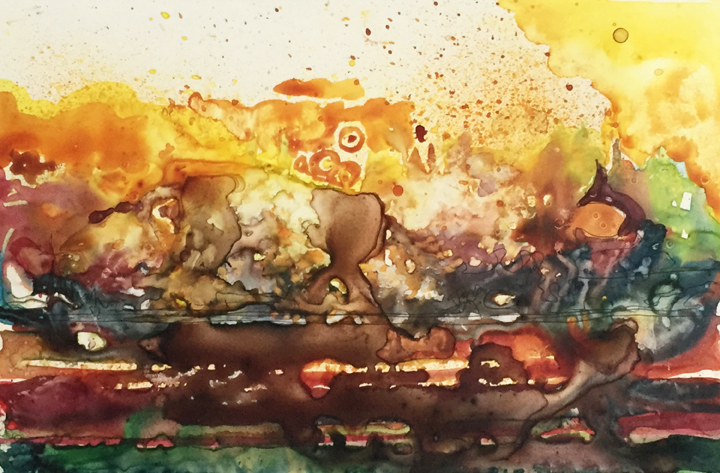 This is called, appropriately, “Heated Landscape” and is for sale at Art Loft just outside the entrance to the Chautauqua Institution. I don’t want to give the impression that I don’t like this painting – I do! It was really fun to work on. The paint has a mind of it’s own, and even so can be added and subtracted easily provided you don’t care about controlling everything that happens. It’s almost like painting on Yupo, but not quite as slippery. 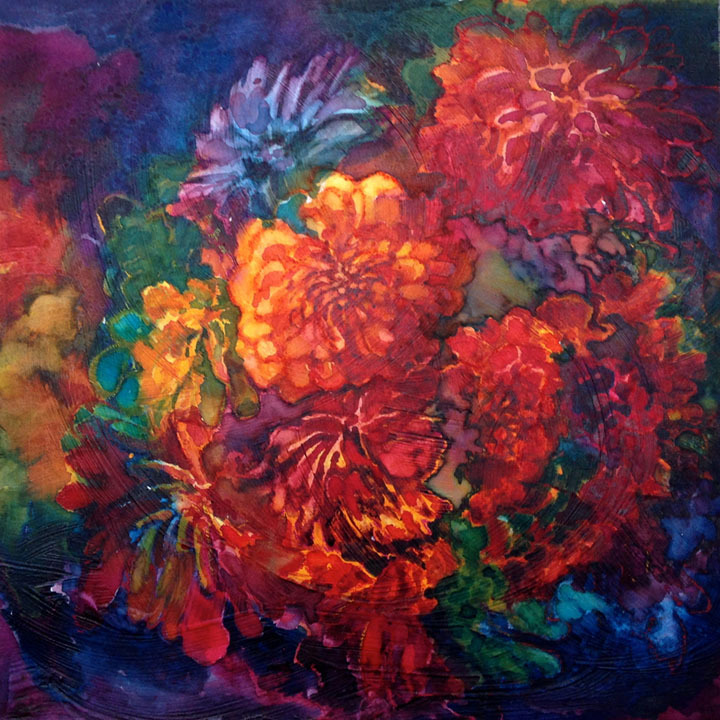 This painting which I call “Bidwell Market Zinnias” after our summer Saturday farmers’ market, also for sale at Artloft, is among my favorites ever. I started out with a circular swirl of high intensity colors, red, yellow and blue, and moved the paint around, adding and subtracting to come up with a painting I really like. Friends who know me well, and admire my paintings, have given me some good advice. They say, in one way or another, include some architecture, some neighborhood, in your paintings, even when you are experimenting. So, these two are very recent, and include architectural elements from my home city, Buffalo. 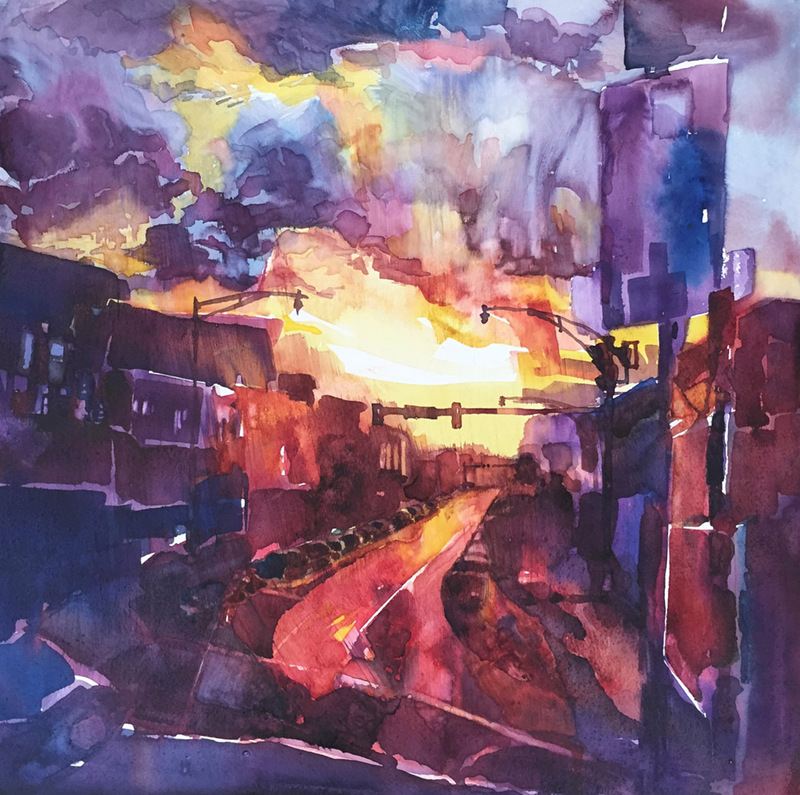 The first, “City Sunset” is the view I have as I look out of my studio across the street, almost due West, at sunset. 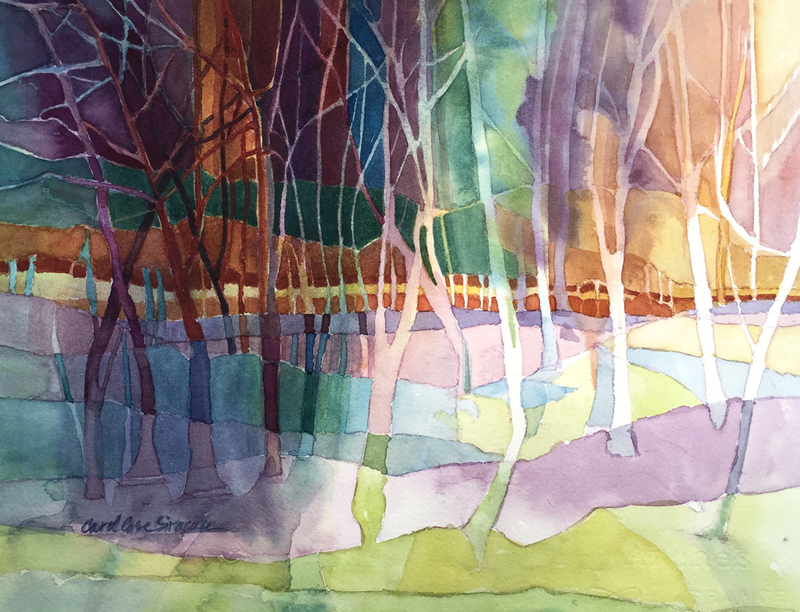 It was accepted into the Adirondacks National Exhibition of American Watercolors which opens August 8th in Old Forge, NY. Very excited to have been juried into this terrific show. This last painting, called “Canalside” is a view from across the newly constructed memory of the Erie Canal at our Lake Erie Shore, is also a favorite. 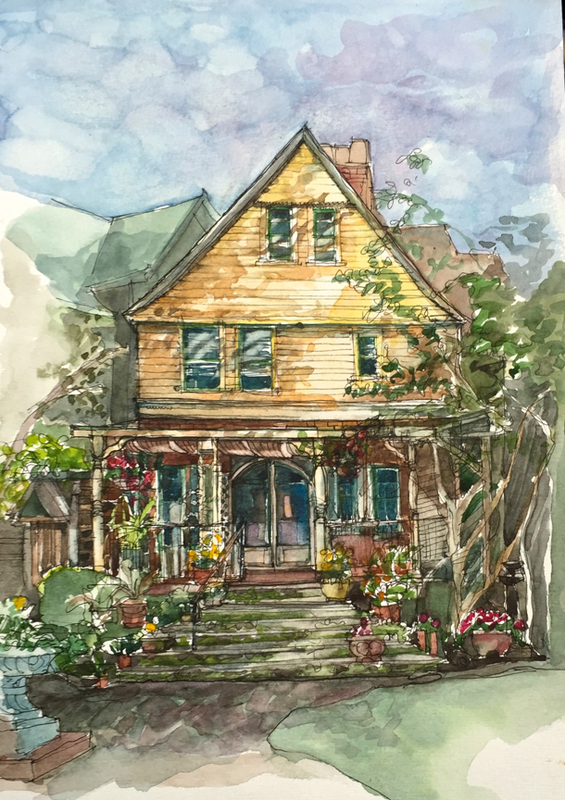 It will be included in the group show, “Art Exhibition – Seeing and Being: Making Art in WNY Neighborhoods” opening Monday, June 1 at 6 pm at Betty’s Restaurant, 370 Virginia St., Buffalo. 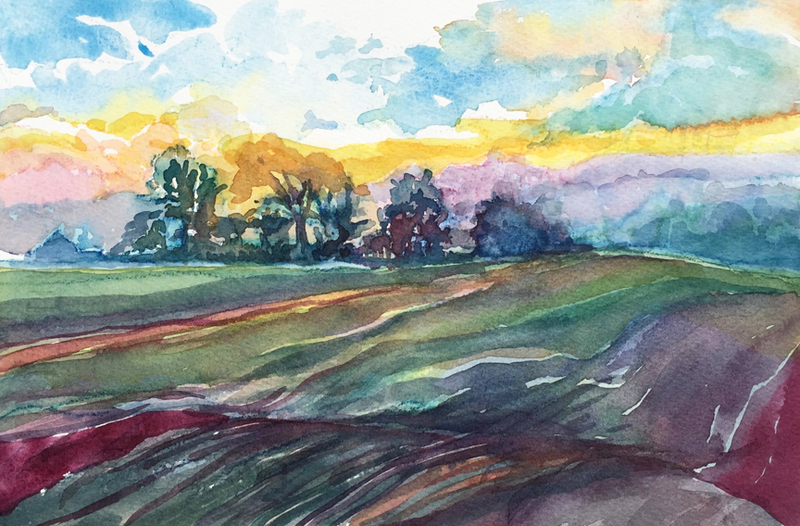 I love to try new ways to work with watercolor and all of the other water media. I am not a young person, though I am a young artist, having really started to get serious about this in the mid 2000’s. Architecture took all my work time and energy for 44 years. I don’t think I’ll be able to paint for the same amount of time….as I’d be painting at age 107, but maybe I’ll still be at it! I’m pretty young at heart!